Professing a policy of cultural and social integration, the American settlement house movement made early progress in helping immigrants adjust to life in American cities. 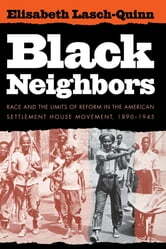 However, when African Americans migrating from the rural South in the early twentieth century began to replace white immigrants in settlement environs, most houses failed to redirect their efforts toward their new neighbors. Nationally, the movement did not take a concerted stand on the issue of race until after World War II. In Black Neighbors, Elisabeth Lasch-Quinn analyzes this reluctance of the mainstream settlement house movement to extend its programs to African American communities, which, she argues, were assisted instead by a variety of alternative organizations. Lasch-Quinn recasts the traditional definitions, periods, and regional divisions of settlement work and uncovers a vast settlement movement among African Americans. By placing community work conducted by the YWCA, black women's clubs, religious missions, southern industrial schools, and other organizations within the settlement tradition, she highlights their significance as well as the mainstream movement's failure to recognize the enormous potential in alliances with these groups. Her analysis fundamentally revises our understanding of the role that race has played in American social reform.